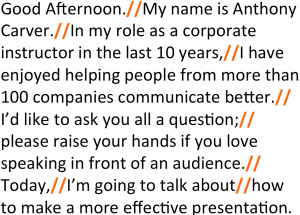 When you are nervous, as most people are at the start of a talk, you tend to speak quickly. This is also a clear sign to the audience that you lack confidence. 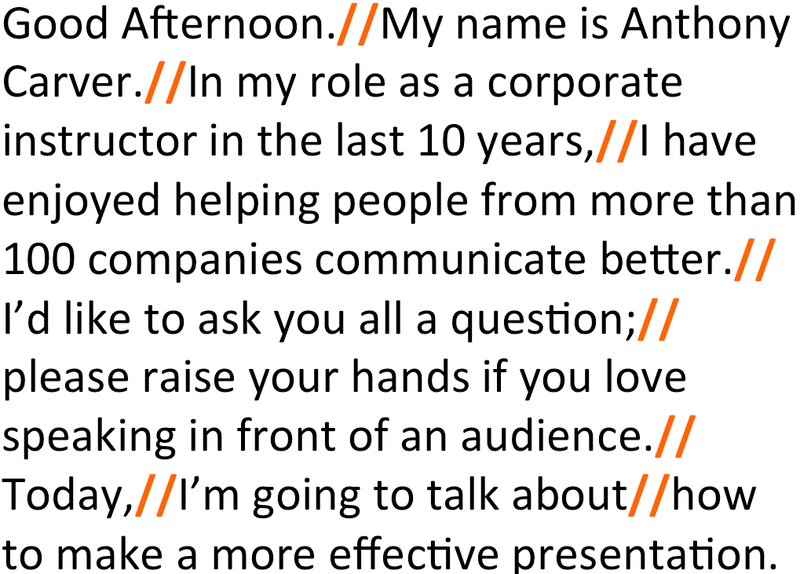 You should remind yourself to make pauses in the opening of your presentation. Leaving gaps will signal to the audience that you are in control and allow you to compose yourself in order to give your best possible performance. Leaving pauses creates some dramatic tension that will connect with the audience and increase their levels of attention. We previously noted this use with rhetorical questions. Your audience’s listening speed is faster than their understanding speed. In other words, if you speak without any pauses, they will hear your voice, but are likely to quickly lose their understanding of your message. Pausing acts as a buffer so that their understanding can catch up with your voice.